Hot Dog! We had a party and you're all invited! We celebrated with Minnie, but all these ideas could easily be changed to fit any theme. I fell in love with the red polka dots and minnie ears and used them on everything. We have ears, say cheers! These party hats aren't just fun to make, they're also easy and inexpensive. A birthday outfit is a small touch that can make anyone feel extra special. Kate cried when it was pried off to go in the wash.
What party is complete without a pinata? All I needed was a Huggies box, a roll of crepe paper, tape and glue. No messy paper-mache or waiting days for it to dry. Mouse hands were made for the kids to wear while hitting the pinata. Of course we needed goodie bags for all the loot. Kate's favorite part of the party was dancing to Mickey's Clubhouse songs with a floor covered in balloons. It was a great party, thanks for coming! For Instruction on how I made things go HERE and HERE. So many great ideas wrapped in one post! I had to smile when you described prying off the birthday outfit for washing. I've been there before! Fantastic job. Most importantly, your daughter obviously loved it. Talk about cute! I love all the details...the goody bags are esp. adorable, love the CAKE! That last pic is sooo sweet! What a sweet party. I love how each aspect fit the theme. Too cute. Wow, thats amazing! I lOVE that little skirt! You should make a tutorial...unless you already have one. :) My daughter has been wanting to wear nothing else but skirts recently, so I really need some cute patterns to make some I don't mind getting dirty! Oh my heavens, how cute!!! LOVE this!! My daughter would freak out over a Mickey Mouse Clubhouse party! How on earth did you do that pinata? I adore it! I know you said it involved a diaper box and some paper... but how did you hold it all together? Oh my goodness! I LOVE this party! Everything is to die for cute! 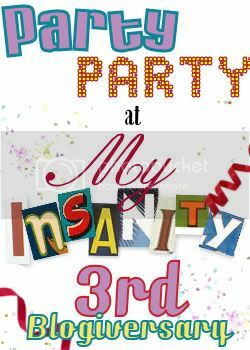 This party MUST be entered in my 'Show Off Your Party' Contest!! Really. Check out my blog for details!~! Wow! What a great party you made! Love your party!! Congrats on second place on SYTYC!! stopping by via your link on the girl creative today. wow! we are impressed - this party was SUPER cute. Right down to every last detail - like the gloves for the pinata turn?!! two ears up! Your featured in my Motivate Me Monday post! Check it out! Your welcome to add your crafts to my link! Such a cute birthday filled with fun and great ideas, I enjoyed looking at it and stopping by to visit your blog. Your blog is adorable. Such creative ideas! I love your resourcefullness!! I dabble in cake dec too, and loved your sisters blog as well!! What a great party!!! I love the cake, it's awesome! You never cease to amaze me! Oh my word, this is so darling! My daughter has been telling me she wants a Minnie Mouse party for a while now. So if that's still on her brain come October, I'm definitely going to be stealing some ideas from you. Adorable! Great way to run with a theme through out the eintire party! And the outfit will be a great reminder for you and Kate in the future! There is a post on bakerella's site and it made me think of your cute party. You should go check it out. Oh...so cute! Made me hungry for Oreos! And you know what else? That Mr. Food plate picture in your header is a real hoot...kinda looks like one of my brothers! OMG This is such a fun party!!!!! This party is too cute! I saw your post on a link party, and had to comment! What a stinking adorable party! I'm jealous- my birthday is coming up, maybe I should do Minnie Mouse! yet another reason i better produce a girl someday! this. is . so .cute. This is seriously the.cutest.party.ever!! Wow, I wish I had a girl! What a cute idea! It turned out great. This is the most adorable party theme! This is adorable...would you mind if I shared it on my party blog?! Wow!! !You did an amazing job!!!! Can you please tell us we are all begging you how you made the pinata?!!!!! Thanks for linking up! I featured this over at iheartnaptime.blogspot.com! I loved it! Hope you come back next week! Wow! Everything looks so amazing! I love the mouse gloves for the pinata! I'll be doing a post Monday showing how I did everything. You are AMAZING. Have a I ever mentioned that before. I wish I lived next door so I could tag along with all of your fabulous ideas. Every single thing that you post makes me drool. Wow. Wow. and Wow again. PS WC is almost here!!! Thanks for listing your party. It is being featured Friday. just saw your party on creative party... WOW! I am so impressed! I can't pick my fav, but the invitations, pinata and the gloves - how creative! So incredibly cute! Please please please tell us how to make the pinata! Awww...this is so great! I love the mouse hands and the cake. The invitations are just perfect. I featured this as part of a party post on my blog. Very cute! This party is lovely. Congratulations for the creativite !!! Oh my goodness! What a festival! So cute. From start to finish, an amazing party! I love that they were swinging the pinata bat using the big white gloves! WOW!!! I can't believe all that you did for this party! How in the world did you do the ears for the top of the cake? I love, Love, LOVE this! What a great way to adapt a commercial party theme to make it elegant and sophisticated, but still make your little one happy! Awesome, just awesome! This is CRAZY precious!!!! I LOVE it! I loved this when I saw it the first time and had to come back and show it off at somedaycrafts.blogspot.com. I am highlighting this at a Disney link-up on Friday! This is precious - I love all your handmade details! Sharing on our FB wall today. Thank you! So cute! I'm not always a fan of character parties, but you made this one so stylish and graphic. Makes me want to throw one for my daughter! Such a cute party! Always love seeing your creative ideas.